Pusuke, the world’s oldest dog at 26 years and eight months, has died in Japan after falling ill and refusing to eat or go on his morning walk. Pusuke was recognized by Guinness World Records as the world’s oldest living dog last December. 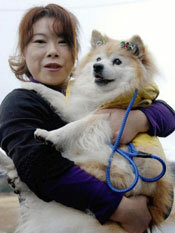 The fluffy tan Shiba mix was recognized as the world’s oldest living dog by Guinness World Records last year. The oldest dog of all time is officially Australian cattle dog Bluey, who managed 29 years and five months before dying in 1939. Give you my money? I don’t think so, punk! Two masked men confronted a couple walking through a Colorado Springs, Colorado neighborhood at 10 p.m., announced they were robbing them and ordered them to the ground. Instead, the husband — who, it turns out, is an American soldier — pulled out his gun and fired at them as they ran away as fast as they could. Next time you want to insult someone, don’t call him a rat. Rats show compassion for fellow rodents, a University of Chicago study has found. Researchers put two rats in shared compartments, where one could roam free and the other was trapped in a tiny cage. The free rat soon learned how to open the cage and spring his companion. Workers at the agency that promotes tourism to South Australia came up with what they thought was a great idea — sending newspapers and broadcast stations goldfish in bowls emblazoned with the words, “Be the big fish in a small pond.’’ But by the time the fish were delivered, most of them were dead. “This is about the dumbest p.r. stunt that I have seen in many years, said Aussie publicity guru Chris Rann. But it got a lot of press. From The Boston Herald, The New York Post and London’s Metro.